Why are my X server configurations not taken into account? I know questions like that have been asked many times but I can't find a way to solve my problem even after reading them and trying the answers. 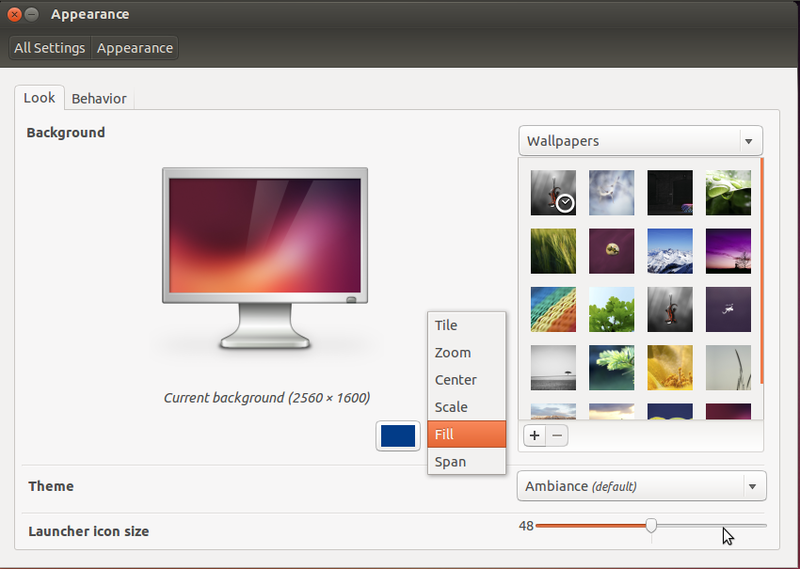 which makes absolutely no sense at all to me, because I haven't touched the main screen's resolution. 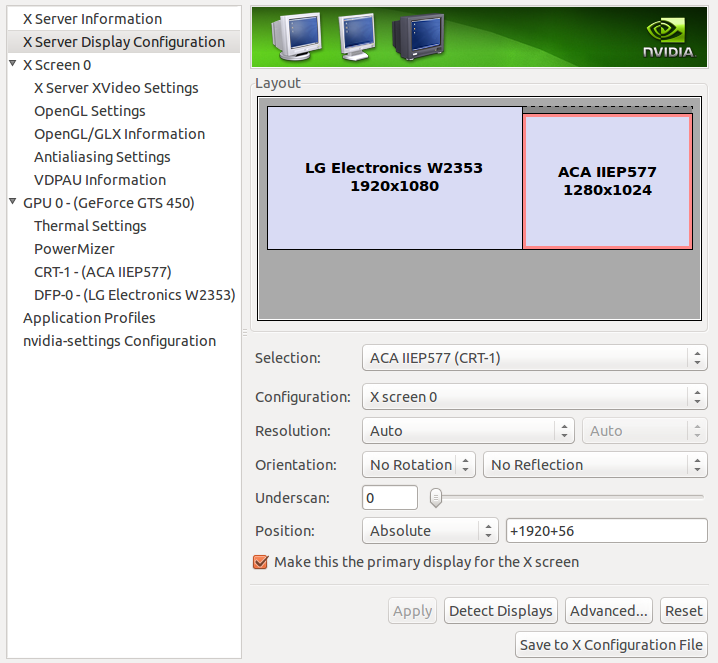 # Removed Option "nvidiaXineramaInfoOrder" "DFP-0"
# Removed Option "metamodes" "DVI-I-2: nvidia-auto-select @1920x1080 +1280+0, DVI-I-1: nvidia-auto-select @1280x1024 +0+0"
This issue appeared when I switched to 13.10. I have just switched to 14.04 but it hasn't improved anything. My GPU is an nvidia GTS 450. Anyone has a clue on how to solve this please ? Option "metamodes" "DVI-I-1: 1280x1024+1920+56, DVI-I-2: 1920x1080+0+0" in both /etc/X11/xorg.conf and /usr/share/X11/xorg.conf.d/xorg.conf but the result is still the same at startup. Option         "metamodes" "DVI-I-2:  1920x1080, DVI-I-1: 1280x1024"
I am not an expert on xorg.conf, the above is based on my own setup which I have finally gotten to work as I wanted. You can have a look at mine here, in case it gives you any ideas. It sets up two screens with either VGA-0 or DP-2 on the right (depending on which one is connected) and SP-3 (my laptop's) on the left. I am pretty sure the Screen 0 "Screen0" 0 0 line in the "Server" section was very important but I did this about a year ago so I don't remember the details any more. Finally, the official nvidia documentation for xorg.conf is really very good and actually explains what the various options do. 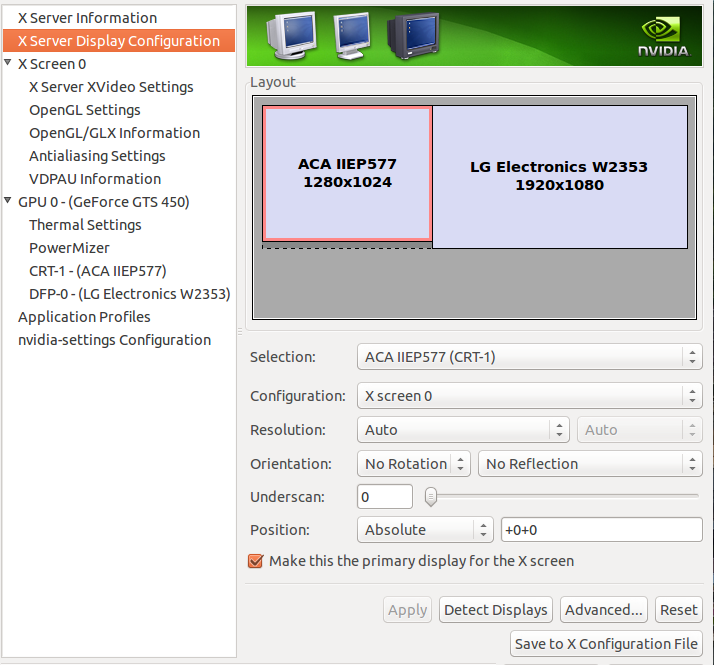 That and the Arch wiki page on NVIDIA are what helped me solve it. Not the answer you're looking for? Browse other questions tagged xorg 14.04 or ask your own question.